The Russian prospective frontline aircraft system. The Russian Aerospace Forces will begin procuring the newest T-50 fighter plane in 2017, Colonel-General Viktor Bondarev, commander-in-chief of the Russian Aerospace Forces, said. "We plan to begin procuring this plane in 2017," Bondarev said on Rossiya 24 (VGTRK) television. 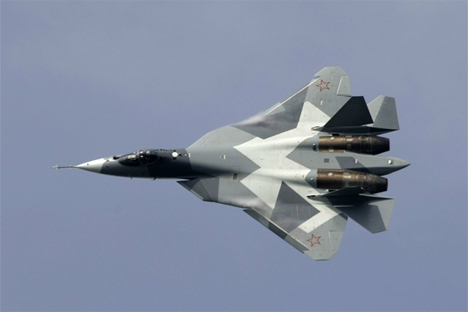 The Russian prospective frontline aircraft system (PAK FA) is a Russian multi-purpose fifth generation fighter. The use of composite materials and innovation technologies, the aerodynamic structure of the plane, the engine characteristics ensure unprecedentedly low radar, optical and infrared signature. That helps considerably increase its combat effectiveness in the work on air and ground targets at any time of the day and in any weather conditions. Bondarev said in late September that the tests of the prospective frontline aircraft system (PAK FA) T-50 were going successfully and would be completed in 2016. "All tests are going according to a previously approved program. The system confirms all its characterstics. And I think we will complete the tests next year in accordance with the program and will begin procuring the T-50 in 2017," Bondarev said.